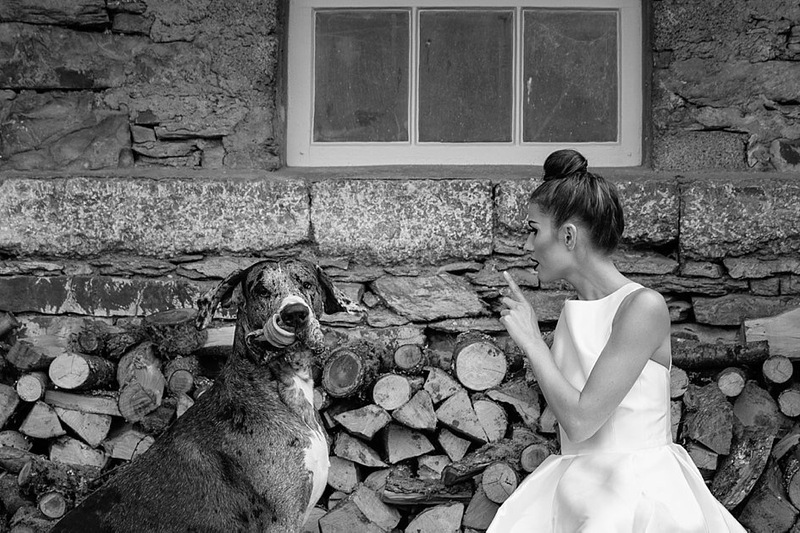 A fantastic collaboration shoot in the Lakes, involving talented photographer Lisa Aldersley and the creative ladies Eve and Nikki from The White Closet. Up in the lakes, the most beautiful remote setting that sits a large cottage surrounded by hills and countryside with views to die for! This in fact is Lisa’s house and what a perfect place for us to spend styling a shoot. (It certainly beats a studio any day). The reason for collaborating was to promote the latest Jesus Piero collection at The White Closet. Eve’s direction was to go for a black and white glamorous style shoot with a dark edge. Her exact words were ” Tim Burton meets Vogue”! 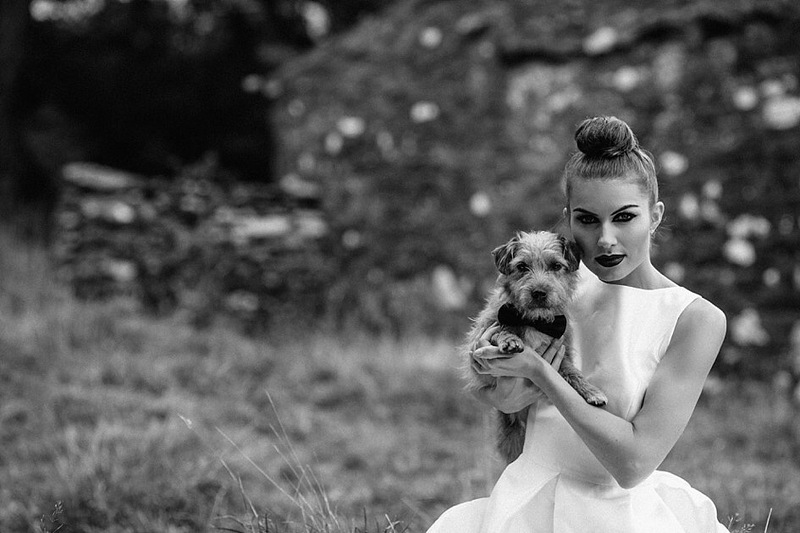 I could tell that this wouldn’t be any normal shoot, as dogs were going to be modelling too. This idea sounded great due to it being so different to any other Bridal shoots I have done previously and it would certainly get my creative juices flowing as a Makeup Artist. With any photo shoot preparation is key especially in designing the makeup look. I wanted to create an extravagant, glamorous look that’s also quite dark and mysterious. Amy was one of the models who had such striking features and amazing bone structure. She most definitely would pull this off down to the ground. I started prepping her skin with moisturiser and primer so the foundation would glide on perfectly. While the primer and moisturiser is sinking in to Amy’s skin I begin on her eyes. To give a dramatic eye I used gel eyeliner in black and painted the eyelids then winging out to give a harsh edge. Using the liner inside the water line top and bottom and then a set of strip false lashes and mascara to finish. The eyebrows was a mixture of gel liner with a dark brown brow powder brushed and blended to give a strong shape. The foundation I used was a foundation stick to give a full coverage but for the skin to still look like skin. What’s great is you can layer and layer but it will never look too heavy and is great for photography. With a dusting of setting powder I then contoured the face with a deep bronzer concentrating mainly underneath Amy’s cheekbones. Adding a slight highlight to the face and cheek bones with a teeny bit of shimmer powder. To finish I used (believe it or not) the black gel eyeliner again for the lips, mixed with a deep plum lip colour. This is to really give that edgy, dark look and it worked like a dream. To be fair the black gel eyeliner was like a Swiss Army knife in this case. Although I know everyone including Amy was startled with the finished look, and quite surprised. Infront of the camera with the stunning Jesus Piero dresses it would look amazing! 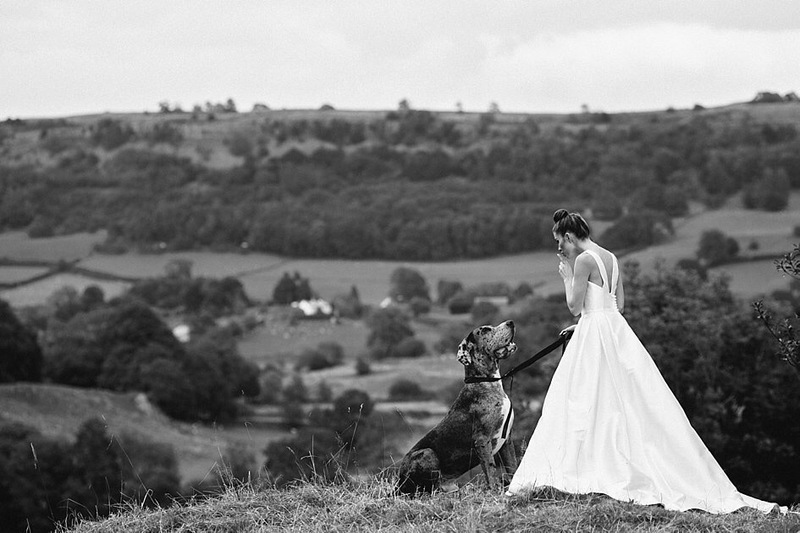 So Lisa worked her magic in her own comfortable surroundings while Eve and Nikki styled the dresses, in the chaos of also posing the models and dogs, adding their creative touches to each shot. I think it is safe to say we all had a fantastic time and what turned out to be a huge success better than we imagined. Now all that hard work and fun is gracing the front page of London Bride Magazine 2015! This entry was posted in Beauty Tips, Bridal, Editorial, Magazine, Makeup artist, Weddings and tagged bridal makeup, bridal makeup cheshire, editorial makeup, makeup artist, photography makeup, wedding makeup, weddings makeup cheshire.